Christmas is one of our favorite times of year. There is just something magical about the sparkling lights, the crisp winter air, the smell of cinnamon and spices, and the sound of fresh snow crunching beneath my feet. While many like to stay close to home during the holiday season, it can also be a wonderful time to travel. If your hometown isn’t known for it’s festive appeal, traveling is a way to experience the magic of Christmas in one of the many places that make the holiday truly come alive. With so many incredible Christmas destinations around the world, we asked some of our favorite travel bloggers to share the best places to spend Christmas. NOT SURE WHERE TO GO? FIND THE BEST FLIGHT DEALS TO ANYWHERE IN THE WORLD ON SKYSCANNER. From famed Christmas markets to lesser known towns with unique holiday traditions, these Christmas destinations will get anyone feeling festive. This list was compiled by some of the most seasoned travelers out there. They’ve seen so much of this beautiful world, and have chosen their favorite holiday destinations to share with you. 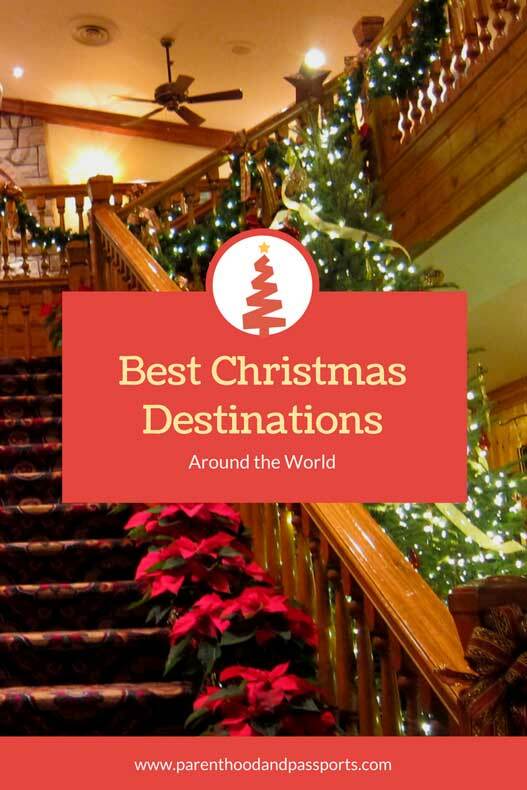 Read about the best Christmas destinations in Europe, North America, and around the world chosen by a variety of talented travel bloggers, then scroll to the very bottom to find out our favorite! Hannah – Getting Stamped Nothing says Christmas more than the European Christmas markets. A few years ago we got to see some of the best on a Christmas market cruise that started in Budapest and went down the Danube River ending in Nuremberg. After our cruise, we headed off to Prague, one of our favorite cities in European. Prague in December is magical; the gorgeous Christmas Market set up in the Old Town is picture perfect. The weather is chilly, but it’s great for sightseeing in Prague, and if you get cold get a cup of mulled wine from the market. We also found the items at the markets were at least half the price compared to other Christmas markets in Germany. Read more about sightseeing in Prague here. Melissa – Suitcase and Heels Newfoundland may be part of Canada but there are some Christmas traditions here that you won’t find anywhere else. We’re full of the quirkiness that isolation often brings. Two of my favourites are the celebration of Tibb’s Eve and mummering. Every year on the eve of Christmas Eve you’ll find Newfoundlanders cracking open their Christmas stash of liquor and hosting a party. Back in the day, Advent was a serious, sober time leading up to Christmas. After weeks of abstaining we just couldn’t hold out any longer and in the mid-20th century created the made-up holiday of Tibb’s Eve as an excuse to have a tipple before Christmas Day. It’s now prime party time in St. John’s. 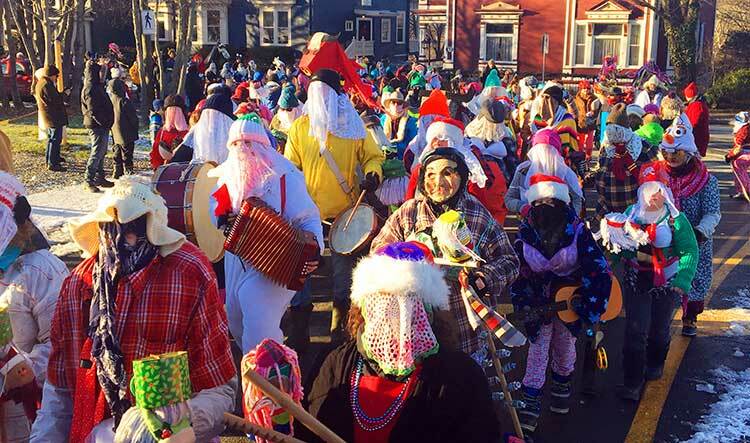 Mummering is another unique Newfoundland experience. Between Christmas and Old Christmas Day you and your friends get dressed up in disguises and costumes and go knocking on doors in your neighbourhood. Neighbours would invite you in and offer you a drink while they tried to guess who you were. In the meantime, you’d pay for your drink with some tunes or a dance. With identities guessed, it was off to the next house to continue the party. These are just two of many reasons why Newfoundland and Labrador, Canada is one of the best destinations for Christmas lovers. Read more about Christmas in Newfoundland here. Enikő – Travel Hacker Girl Christmas in London is really magical. The whole city turns really festive around November. Shops and restaurants will have beautiful decorations inside and outside. Streets will be lit up with gorgeous Christmas lights. There are many pop-up ice rinks all over the city. Pubs will make a special menu for the festive season and try and make their place more inviting by coming up with cool ideas like installing curling lanes and igloos for the Christmas period. Cinemas will start showing Christmas movies. Backyard Cinema has a unique theme where you will walk through an Enchanted Woodland before arriving at the main area, where you can make yourself comfy on beanbags or sofas to watch a festive film. My favorite thing to do in London during Christmas in visiting Christmas markets. Winter Wonderland is the biggest one. It has lots of food stalls, rides, ice skating rink, circus and live music. It is an absolute must for everyone in the city during this time of the year! 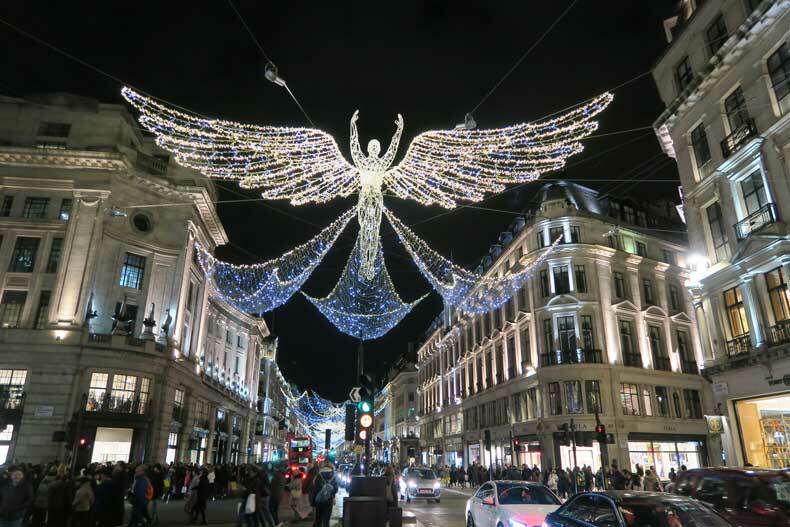 Read more about Christmas in London to inspire your visit. 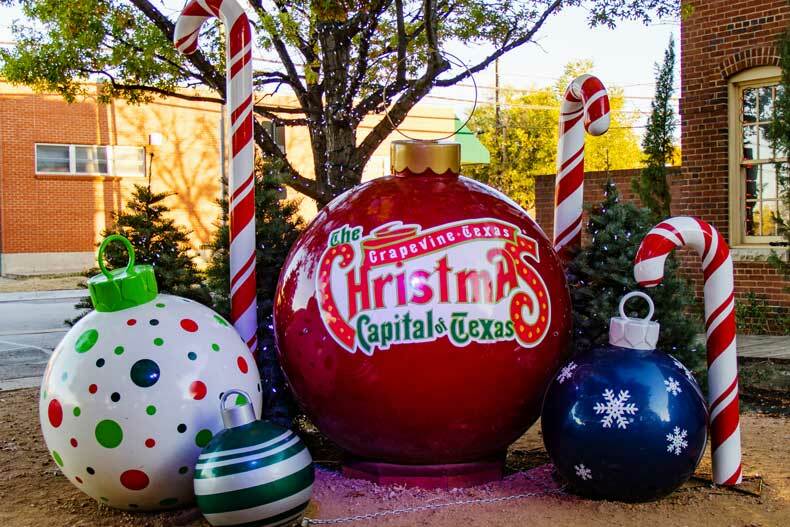 Michelle – That Texas Couple For some southern hospitality and a true Texas-sized Christmas celebration, head over to ‘The Christmas Capital of Texas’, Grapevine. Grapevine is located just outside of Dallas and is planning to host over 1,400 events for the 2017 holiday season. The festivities kick off with a grand parade and tree lighting ceremony on Grapevine’s historic Main Street. After the opening ceremonies, spend time exploring everything Main Street has to offer. Not only is it dripping with lights this time of year, but you will also find several Christmas trees, a mistletoe kissing booth, and numerous boutiques and wineries all decked out for the holiday season. Kids will love hopping on the Grapevine Vintage Railroad to experience ‘The North Pole Express,’ a themed train ride complete with singing elves and an appearance from Santa and Mrs. Clause. Adults can also ride the Grapevine Vintage Railroad on a Christmas Wine Train where they will enjoy a special meal and two glasses of wine! Adults and kids alike are awe inspired when they step into ICE! at The Gaylord Texan Hotel, a walk-through winter wonderland made entirely from ice. If you have more time, then check out the Christmas concerts and movies taking place at the historic Palace Theatre. These are just a few of the many events that Grapevine, Texas has to offer. Whether you want and exciting time with the kids, or a romantic evening, Grapevine will have dreaming of Christmas in no time! Find inspiration to help plan a Christmas trip to Texas here. Stephanie – The World As I See It Toronto is a great destination for Christmas lovers. In the heart of a Canadian winter you’ll easily find yourself in the Christmas spirit with cool temperatures and a blanket of brilliant white snow. And around the holiday season there is plenty to do and see in Toronto. Christmas in Toronto means skating in Nathan Phillips Square, shopping at the Eaton Centre – where you’ll find Canada’s largest Christmas tree, and checking out all the Christmas markets that take place across the city. As I said, one great place to go to in Toronto for Christmas is Nathan Phillips Square where they hold Holiday Fair in the Square. This fair-meets-Christmas market will keep you busy on rides and shopping through the array of stalls. The square is also surrounded by a variety of food trucks. And my favourite food choice is cheesecake on a stick! But one of the best places to go in Toronto during the holiday season is the historic Distillery District. Here you’ll find the Toronto Christmas Market that’s dubbed one of the best in the world. Reminiscent of European Christmas Markets, Toronto’s will certainly enchant you. With carolers, a huge Christmas tree, lights strung up, and lots of market stalls for all your Christmas shopping needs, the Toronto Christmas Market is best experienced when the sun goes down. Enjoy a hot cider, as you wander over cobblestone alleyways, and shop the markets in search of the Christmas spirit in Toronto. Get inspired to visit Toronto at Christmas here. Jurga – Full Suitcase Antwerp is my favourite winter holiday destination in Belgium. There is always so much to see and do in the city, and the holiday season is no exception. First, there is of course the annual Antwerp Christmas Market in the most spectacular setting surrounded by the beautiful buildings of the old town. Every evening the city comes to life with the hundreds of market stalls selling traditional arts, crafts, and all kinds of local food and drink specialties. Tip: Don’t miss the Belgian jenever, a traditional liquor of Belgium and the Netherlands and Belgium, the predecessor of gin. Jenever comes in many different flavours and is as unmissable part of any Belgian Christmas Market as Glühwein is in Germany. For families there is an ice skating rink and a sort of fair with all kinds of winter-themed rides for the children. My other favourite is the incredible light spectacle China Light festival in the Zoo of Antwerp. It’s now the second time that this event comes to Antwerp for the winter holiday season and it’s truly magical. Don’t miss if visiting Antwerp for holidays! Here you can find more inspiration for the best things to see and do in Antwerp. Sherrie – The Wheel Traveler Nestled in the mountains of northern Washington is a small piece of European charm known as Leavenworth. Established in the early 1900s as a logging town, the region nearly became a ghost town when the railroad was rerouted and the logging and sawmill operations moved away. Rather than accept their dismal fate, the city planners decided to give the town a facelift patterned after the German state of Bavaria. The concept worked, bringing millions of visitors to this Pacific Northwest village every year. The most popular time of year to visit is probably during the annual holiday celebration. 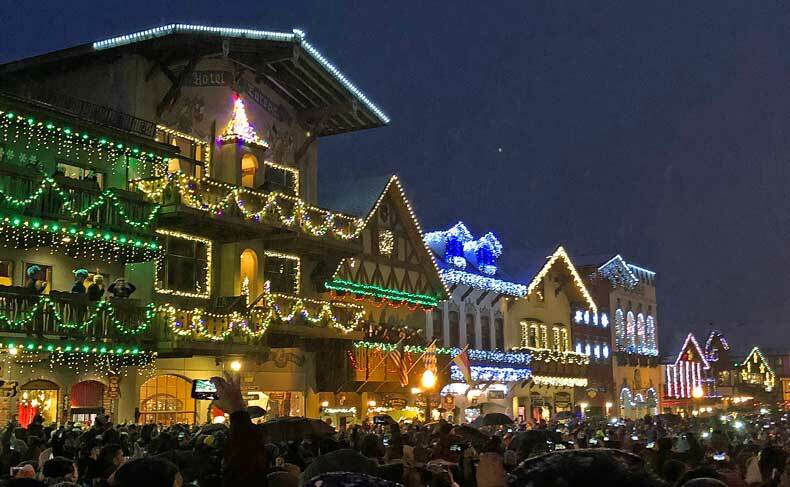 Starting the day after Thanksgiving with a European Christmas market, Leavenworth’s calendar is jam packed with activities that will put you in the holiday spirit. There are nutcracker hunts, a cookie crawl and free photos with Santa for the kids, concerts, plays, sleigh rides and craft fairs for everyone, and sledding, snowmobiling, skiing and snowshoe tours in the surrounding mountains. But the crowning event of the season is the celebratory lighting ceremony that takes place every Saturday and Sunday night in December. Front Street is blocked off to accommodate crowds and the scent of pine mingles with roasted nuts, hot chocolate, kettle corn and mini donuts from the pop-up stands lining the park. As the sun goes down (around 4:15 this far to the north) the spectacle begins. During the ceremony, lighting “angels” march through the street, bringing more than half a million lights to life. Because most everything is compressed into the four blocks of Front Street, the view is truly breathtaking. Check out Sherrie’s blog The Wheel Traveler for more great travel tips and inspiration. Ana – Merry Go Round Slowly Are you looking for the best place to feel Christmas vibes? The answer is definitely Vilnius, Lithuania. Although the tradition of Christmas markets is rather new for us, the city embraced it and takes the decorations seriously. 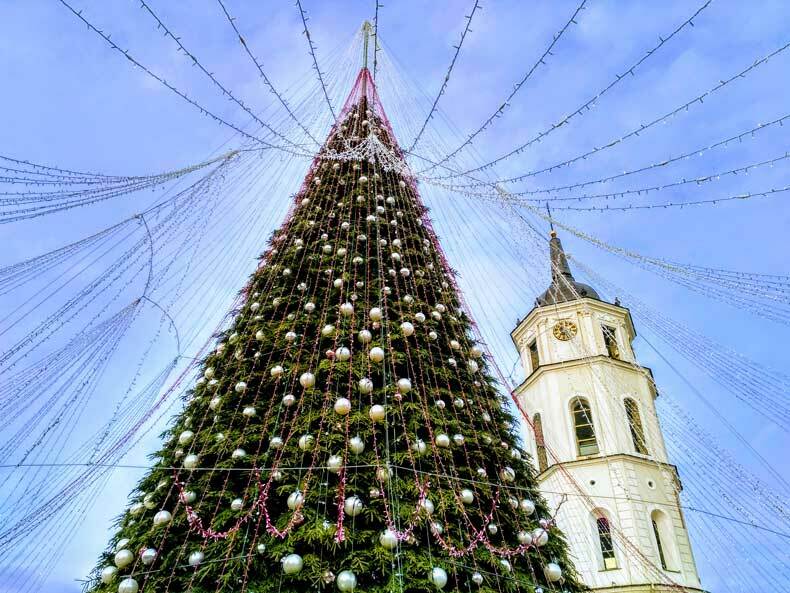 The main Christmas tree at the Cathedral Square is lit up with a ceremony on the 1st of December and for the last several years makes it to the top 10 most beautiful trees around the world in most of the media. You can also enjoy the Christmas market around the tree as well as in the City Hall Square, keep yourself warm with a glass of mulled wine or a local traditional hot beer with honey. Children (and grown ups!) will for sure enjoy the Christmas train, which drives around the city centre, and the 3D projection of some fairy tale (every year a new one) on the walls of the Cathedral. Although the Christmas Eve (24th December) itself is traditionally celebrated at home with the family, you can enjoy all the festive atmosphere all throughout December until 6th of January. Find more travel inspiration on Ana’s blog Merry Go Round Slowly. 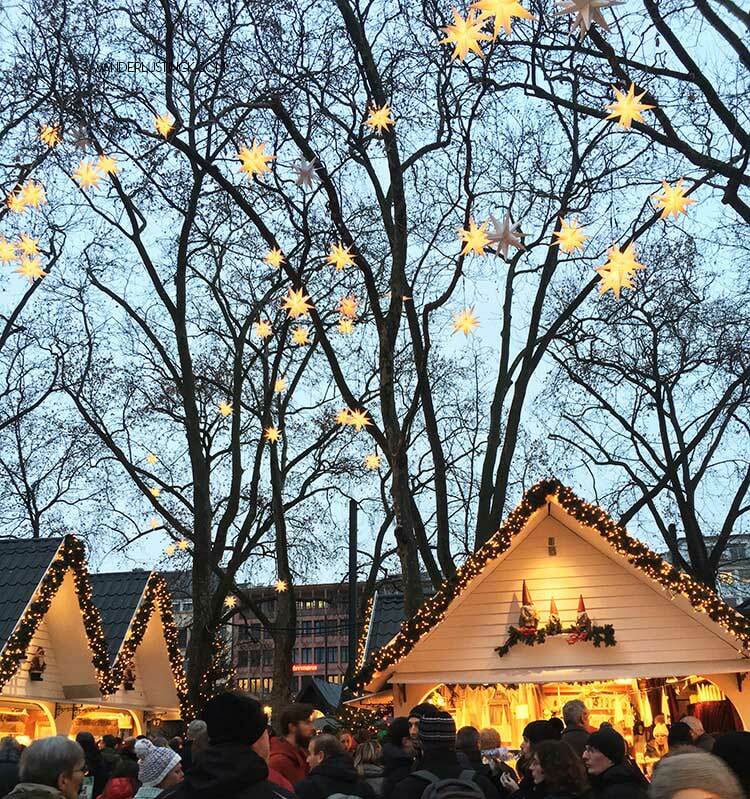 Karen – WanderlustingK Christmas in Cologne, Germany is truly special. If you’re into Christmas markets, uniquely themed markets, beautiful lights, and gluhwein, you’ll quickly fall in love with this German city celebrating Christmas. Although Cologne can be quite crowded in December, it is worth dealing with the crowds to at least see the big market underneath the big church as there’s nothing like the big Christmas tree, the many lights, and the church looming in the background. For couples, it’s quite romantic walking around while sipping gluhwein while shopping for loved ones. I ended up getting a lot of presents for both myself and my family members after finding some beautiful artisanal finds. Even for those less into shopping, there are many things to do besides the markets and chocolate lovers will love the chocolate museum in Cologne. Read more about the Christmas markets in Cologne here. Nicole – Travel Gal Nicole Celebrating Christmas in the summer in New Zealand is a different experience. It is the summer holidays in New Zealand at Christmas time so the kids are off from school and most businesses close down over the break so it makes it a very relaxed and fun holiday. As the weather is warm, very few people do the traditional dinner meal. Instead, think barbecues, shorts and sandals, and beach cricket. At the end of the day, a walk along the beach or a game of cricket to help you digest all that food is a great way to end the day. 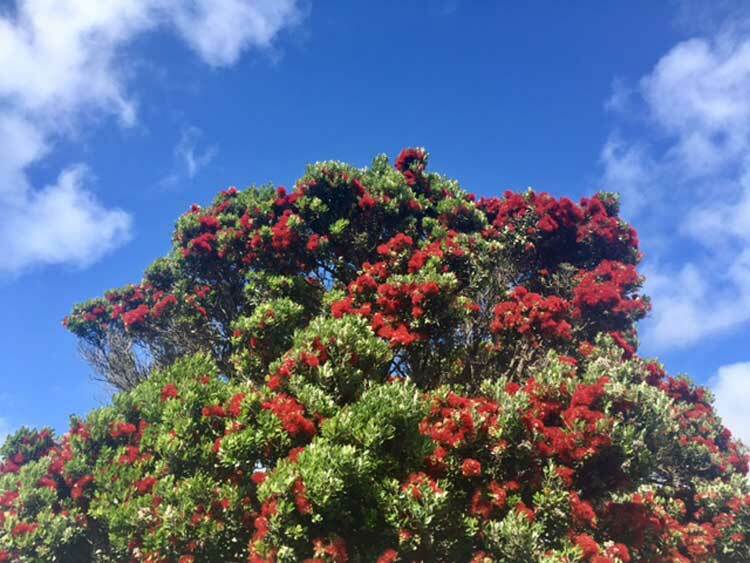 In New Zealand, we also have a tree we call the Christmas tree, as it blooms around Christmas time and it has red flowers – the Pohutakawa Tree. Find more travel inspiration on Nicole’s blog Travel Gal Nicole. Deni – The Full-time Tourist Waking up Christmas morning at the Revelstoke Ski Resort in the Canadian Rockies was by far one of the best Christmases I had to date. My family was sharing a condo on the mountain with my aunt and uncle and 5-year-old cousin. At 7 am, the door to my room flung open and my little cousin came running to my bedside yelling excitedly, “Santa came! We were good!” And then he ran to the little Christmas tree that was in the living room in anticipation of opening presents. Although there were only one or two presents under the tree for everyone, the ski resort was the best present of all! Immediately after a hearty breakfast, we put on our ski gear for the day and head out onto the hill for a Christmas Day ski! It was one of the most beautiful days on the hill with clear blue skies and a fresh dump of snow. And best of all, we had the hill mostly to ourselves! 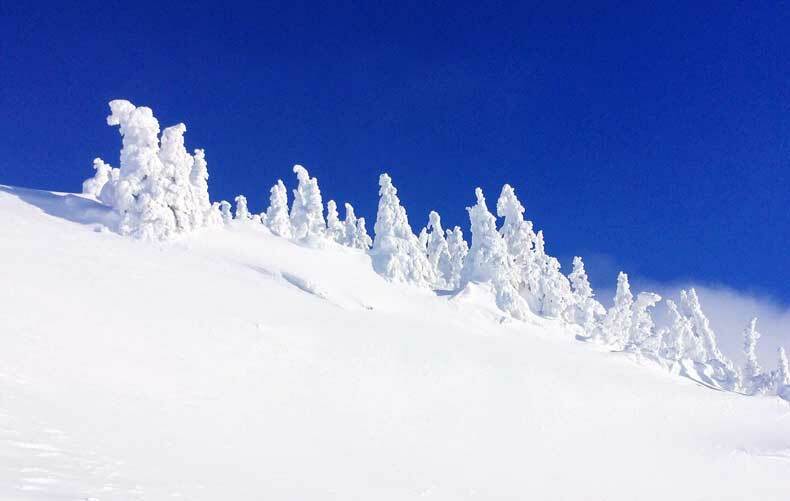 Read all about skiing in the Canadian Rockies here. 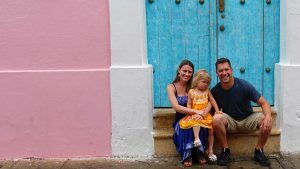 Bryony – Travels and More As you can imagine it’s often difficult to feel festive in 30+ degree Celsius heat, but somehow Cartagena on the northern Caribbean coast of Colombia found a way to make the festive period as magical as any icy European Christmas. Whether it was the abundance of twinkling lights hanging from the iconic clock tower and entrance of the Old Walled City of Cartagena, or the subtle religious Christmas references we’d notice in shopping centres, bars, and hotels. 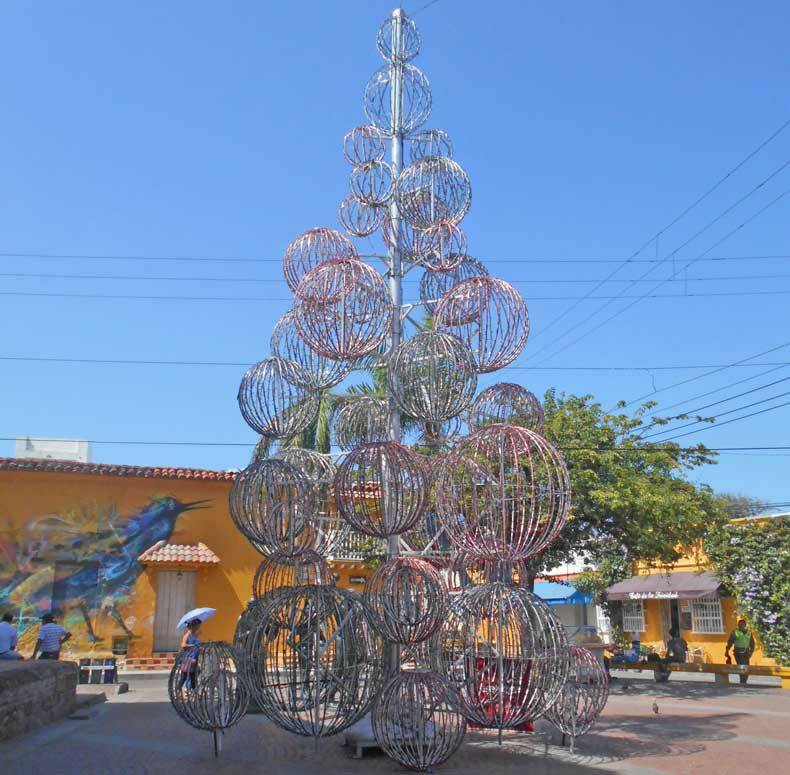 Cartagena, like most catholic Latin American countries, brings a unique vibrancy to the meaning of Christmas. Somehow, the mixture of Colombian Christmas traditions, classic Santa decorations in the street, and the sheer abundance of tourists in the city all make Christmas in Colombia special. Expect evenings to be most festive, as families celebrate under the cover of darkness and shaded from the Caribbean heat. Enjoy the busy walled city and popular backpacker area of Getsemani and expect to feel ‘at home’ in any hostel or hotel. Discover more about Christmas in Cartagena here. Sage – Everyday Wanderer One of the things that is unique about Christmas in the Netherlands is a 20 day separation between gift giving and Christmas. On the first Saturday after November 11th, Dutch children welcome Sinterklaas (St. Nicholas) when he arrives by boat from Spain. Tall and stately, Sinterklaas wears the long, red robes and pointed mitre hat of a Catholic bishop. Instead of on Christmas Eve, presents arrive overnight on December 5th when Sinterklaas rides his white horse, Amerigo, over the rooftops and deliver gifts and other goodies to well-behaved children. With much anticipation, children put their shoes out with treats like carrots, hay, or sugar cubes for Amerigo. In their place, along with gifts, Sinterklaas will leave treats like mandarin oranges and a chocolate letter of their first initial. Christmas trees aren’t put up until after Sinterklaas has brought presents and had his feast day, so don’t expect to see them until December 7th. Christmas is celebrated over two days in the Netherlands with both December 25th (Eerste Kerstdag or First Christmas Day) and December 26th (Tweede Kerstdag or Second Christmas Day) observed as public holidays. Because gifts have already been delivered earlier in the month via Sinterklaas, the two days of Christmas are typically celebrated with a focus on quality time spent with family. 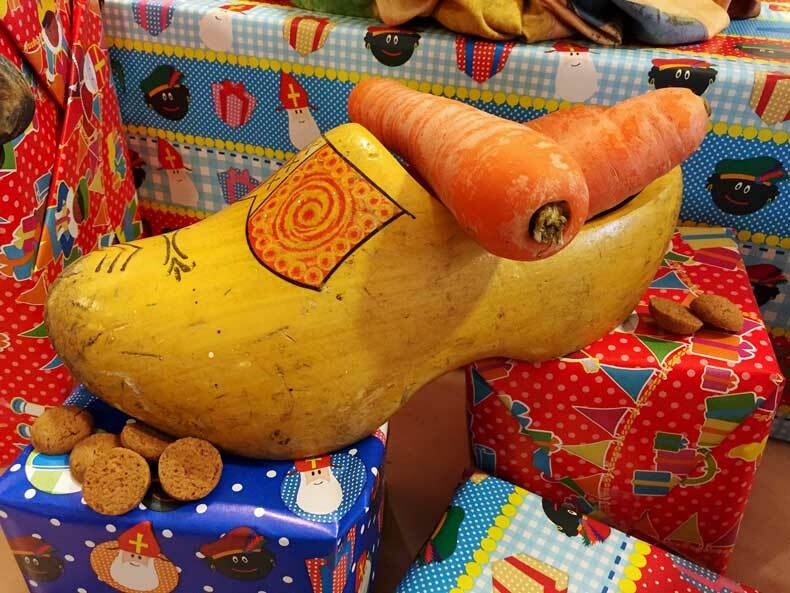 Discover more about Christmas in the Netherlands here. Kelly – Girl with the Passport I love Christmas and I love celebrating this holiday in different countries around the globe. For me, there is something magical about celebrating a holiday through the eyes of another culture. It feels almost like you’re experiencing the holiday again, for the very first time. At least that’s how I felt when I spent Christmas in Stockholm, Sweden. When I arrived, I had no idea that Christmas Eve was actually the day when most people celebrated the holiday. So, when I arrived at the train station and explored the Christmas market there, I was completely bewildered by the fact that the station was totally deserted. And not only that but literally nothing was open, except for the charming Skansen folk village. 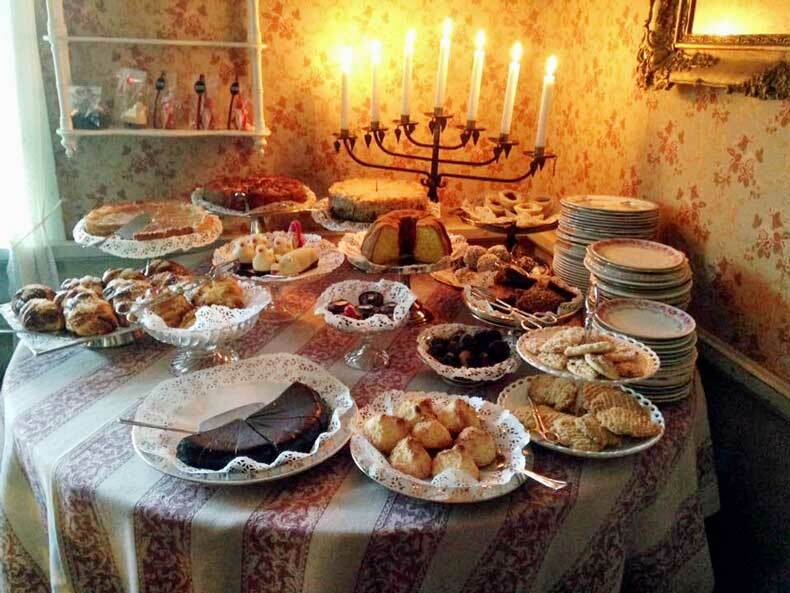 Here, this traditional Swedish village recreated the holidays with traditional saffron cakes and mulled wine that was served on fine china and by candlelight. But besides the food, the village also had reindeer that you could see, traditional Christmas decorations on display, and even a special Christmas recital where traditional Christmas songs were performed in Swedish. A truly enchanting experience that really helped me embrace the true spirit of this beautiful holiday. Find more great travel stories and information on Kelly’s blog Girl with the Passport. Melissa – Parenthood and Passports Jackson, Wyoming is one of our favorite locations any time of year, but the charming ski town is even more magical at Christmas. White lights are strung across the streets and illuminate the town square. Winters in Wyoming are cold, but getting bundled up and walking the streets with hot cocoa makes the bitter chill bearable. At Christmas time, we love staying at the historic Wort Hotel in the heart of Jackson. 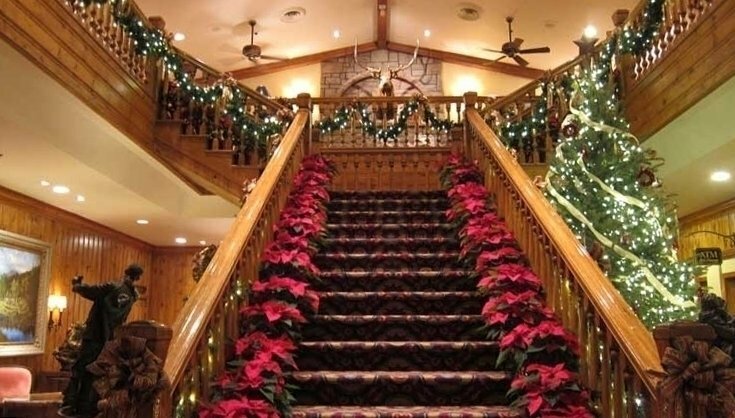 The grand staircase is beautifully decorated with lit garland, poinsettias and a large Christmas tree. It’s perfect for a cozy Christmas! If you enjoy winter sports, Jackson Hole, Wyoming is also known for its skiing and snowboarding. But non-skiers will also enjoy this great part of the United States. Snowmobiling, dog sledding, sleigh rides through the National Elk Refuge, and hot springs make Jackson one of the best places to spend Christmas! Learn more about visiting Jackson Hole, Wyoming with kids here. What are your favorite Christmas destinations in Europe, the US, Canada, or anywhere else? Let us know! Leave a comment below and tell us what you think is the best place to spend the holidays. Looking for more winter travel inspiration? Check out these real-life winter wonderlands around the world. I thought the same thing! 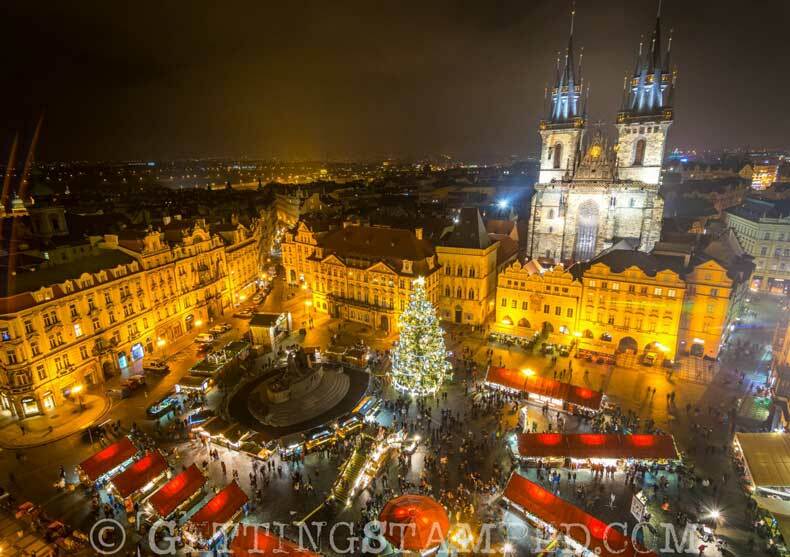 I love Prague anytime of year, but that picture from Hannah at Christmas makes me want to visit during the holiday season! What an amazing list! So many great destinations and events! I hope to experience Christmas in London one year. Or Sweden. All of these look wonderful! I agree! I want to visit them all! I’ve heard so many great things about Leavenworth this year. Thanks for sharing your insight on it! Love reading about all the different traditions and celebrations all over the world. Great post, Melissa! Thanks, Jurga! 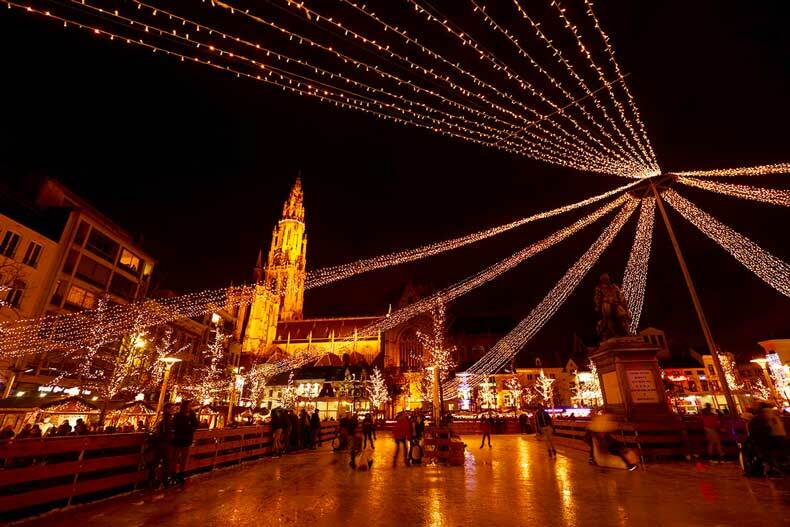 Your photo of Antwerp makes me want to spend Christmas in Belgium soon! This is a great list. We typically don’t travel at Christmas but have visited many of these great locations at other times of the year. Same here. Although, we do sometimes travel the week before or after Christmas. We usually try to stay home in our Christmas pajamas on Christmas day. So many more amazing place to spend Christmas! Thanks for including us. 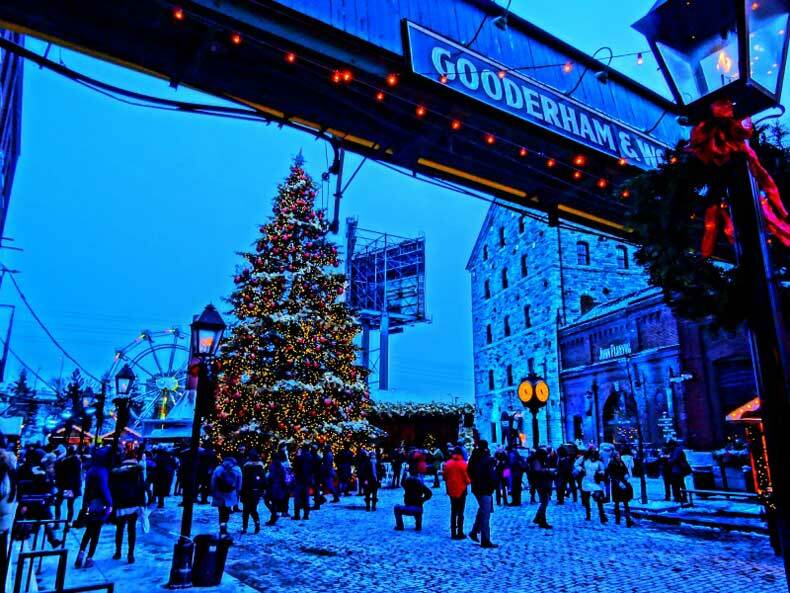 I can remember visiting the distillery district in Toronto, and can only imagine how wonderful it looks at Christmas! I agree with Prague, and I’ve been in Christmas in Amsterdam and loved it too! The Texas one sounds a bit different too! Oh I’ve been to Prague during the autumn and it was gorgeous!! It must be really magical dyring Christmas!!! I have a friend in the Netherlands….maybe next year pass the Christmas there!!! What a lovely list! I have been in London during Christmas. Both the winter wonderland and the christmas market were amazing! I really want to try visiting Germany around christmas sometime. Toronto also seems like a wonderful option. There is an awesome Crystal Cruise that takes you through the European Christmas markets. I can’t wait to see these magical places at Christmastime! 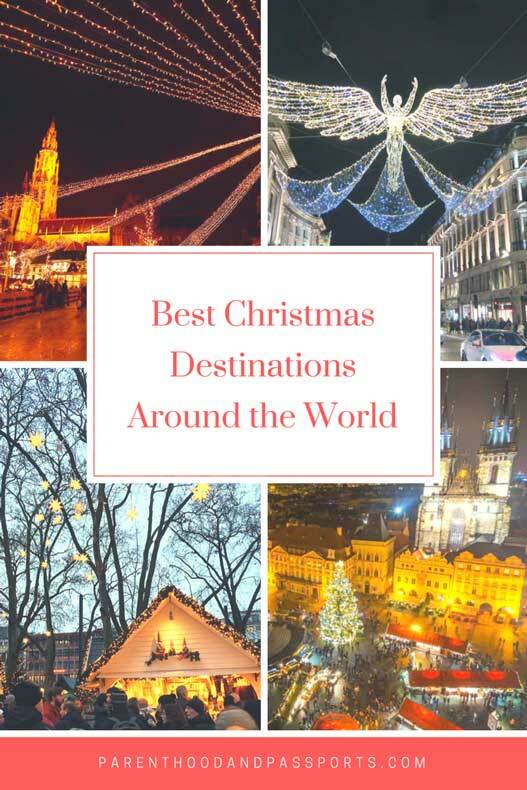 So many great places to experience Christmas around the world! I’ve never been anywhere other than home and in Toronto for Christmas, but I’d love to check out some of these incredible destinations.